Thanks very much. It was a lovely walk, but a very long one! Thanks very much. It was exhausting, but stunning views! It certainly is! We walked 12 miles of it! i want to head off there too:) looks like fun. pretty with the flowers and the deep blue sea. It was a lovely walk with stunning views, we really enjoyed it. What a view! I hope you enjoyed the trek! Thanks very much, we certainly did! Thanks very much. Nothing more secret than a very long walk! Looks like a stunning walk, where were you? 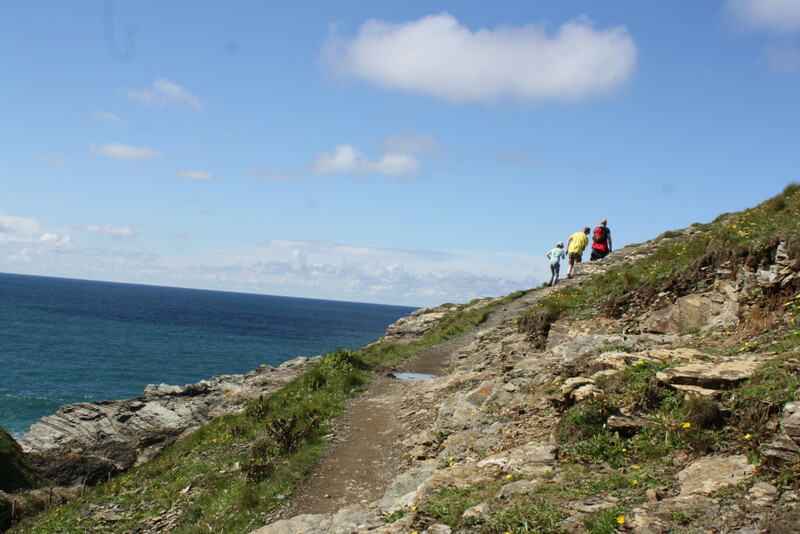 It was the South West Coast Path near Padstow. We walked a very long way! I’m looking forward to doing more of this kind of thing with my two-we tried a short walk this summer and they really enjoyed it. I do love coastal walking. That’s good. My kids can walk a really long way now! This was 12 miles, although we didn’t realise it was quite that far! That looks like a steep climb! It was very steep! Was a lovely walk, but not an easy one! Great picture – love a coastal walk and that blast of sea air. Thank you. The views were absolutely stunning! Thank you! The scenery was beautiful. Wow, what a beautiful place for a walk, I bet the view was fabulous! Thank you. It really was fabulous! Thanks very much. The views were absolutely beautiful. We’ve never done the Coast Path before, but will definitely do it again. Gorgeous photo – love the seaside, looks like a great place to walk – and no rain?! Thanks very much, it was lovely. We actually had less rain than was forecast, thank goodness! Thanks very much. The views were stunning! Ha, I would be a little worried that high up ..
What a fabulous picture. Love the way the path disappears over the hill. That looks like a great place to sit and think a while!